is a postdoctoral fellow in cognitive neuroscience at the University of New South Wales in Australia. 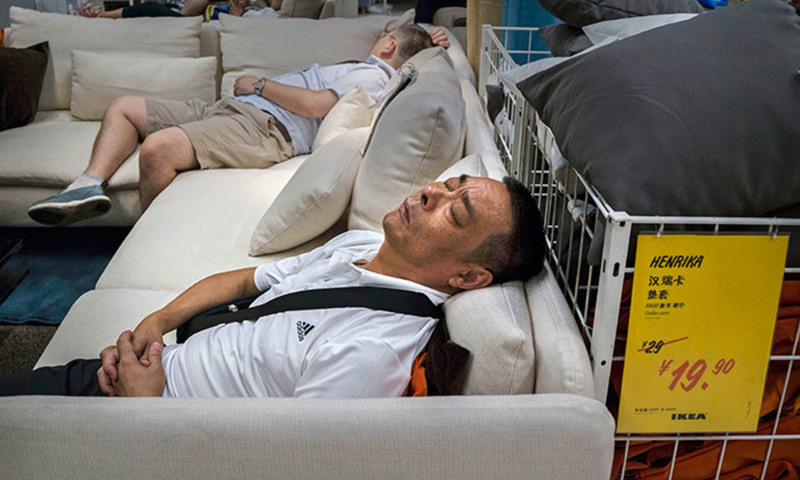 Imagine you are at Ikea to pick up a sofa for your new flat. You see one you like, a wine-coloured two-seater with big soft cushions. You imagine what it would look like with your current furniture, and decide that’s the sofa you want. As you continue meandering through the store you find a nice industrial-style lamp and coffee table, so you try to imagine what they might look like with the sofa. But imagining all three items together is more difficult than just imagining the sofa alone. How many pieces of furniture do you think you could rearrange in your mind? Is there a limit to how much we can imagine at once, or is our imagination truly unlimited? This is the question that my supervisor and I tried to answer in our lab at the University of New South Wales recently. Instead of furniture, we used simple shapes known as Gabor patches, which are essentially circles with lines through them. We also used a visual illusion known as binocular rivalry. Binocular rivalry occurs when two different images are shown, one to each eye, and instead of seeing a mix of the two images you see only one of them, either the image that was presented to the left eye or the image presented to the right eye. Previous work by Joel Pearson (my supervisor) has shown that simply imagining a Gabor patch, or seeing a very weak Gabor patch, will make you more likely to see that image in a subsequent binocular rivalry display. For example, if I asked you to imagine a red Gabor patch for a few seconds, and then presented you with a binocular-rivalry display comprising of one red and one green Gabor patch, you would be significantly more likely to see the red image rather than the green one. This is known as priming, and is often measured as the percentage of trials primed (that is, the percentage of times that an individual sees the imagined image in the subsequent binocular-rivalry display). Since this task has only ever been studied using one image, we decided to test just how many items we could imagine at once. If we were able to imagine an unlimited number of items, then we should see the same level of priming for one or multiple images. We started off ambitiously, asking participants to imagine anywhere from one to seven images. We presented them with cues that indicated how many, and what colour and orientation Gabor patches they should imagine. Importantly, the cues we gave them were present during the entire time the participants imagined, meaning there was no confounding effect of memory, as they didn’t have to remember which image to imagine where. We found that our participants were limited in what they were able to imagine, with their priming falling to chance levels when they had to hold about three or four items in their mind. We followed up this study with a few more experiments, and found that our subjects also rated their visual imagery as less vivid when they were required to imagine more items, and that the precision of these items decreased when they were required to imagine more than one image at once. So it can indeed be shown that there are severe limitations to our visual imagination. Why? It is likely that visual imagery-capacity limits arise somewhere in the visual-imagery brain network, which spans frontal and posterior visual areas of the brain. The frontal areas are thought to be responsible for the control and creation of visual imagery through top-down connections that feed into the sensory (in this case, visual) areas of the brain. These top-down connections are proposed to manipulate the firing rate, or synaptic connections, of the neurons in visual areas of the brain leading to the experience of visual imagery. We can think of these top-down manipulations as creating ‘maps’ of the images that we imagine in the visual areas of our brain. When we imagine multiple images, we create multiple maps, and these maps compete for space in the brain’s visual areas. This competition and interaction between imagery maps is, perhaps, what gives rise to our capacity limits. Why do these limitations matter? Visual imagery is, after all, involved in more tasks than buying sofas and tables from Ikea. Take the treatment of mental illnesses for example. Phobias are commonly treated by imaginal exposure. The therapy works by repeatedly exposing someone to the thing that causes them anxiety, such as spiders, plane rides, public speaking, heights etc, and this repeated exposure leads to a lessening of the fear response. For obvious practical reasons, it can be difficult to expose people to these situations repeatedly, so clinicians use imaginal exposure instead. The patient imagines the fear-inducing stimuli in as much detail as possible, and this is thought to work in a similar way to actual exposure to the stimuli. Another form of treatment in clinical psychology involving visual imagery is imaginal rescripting, which is used to treat many different disorders such as depression, generalised anxiety, obsessive-compulsive disorder, and eating disorders. Imaginal rescripting involves participants imagining, or simulating, scenarios from the past or future that are fear- or anxiety-producing. They imagine these scenarios in as much detail as possible, and then are asked to imagine an alternative scenario or outcome that is more positive – they ‘rescript’ the memory or thought. They are also taught how to change their thinking towards these scenarios during the process. Although imagery-based therapies, such as imaginal exposure and rescripting, have been shown to be one of the best cognitive behavioural therapies out there, they are not 100 per cent effective. It might be that one of the factors influencing how well these treatments work might be the ‘realness’ of the scenarios created in the mind, which is affected by both the capacity limits of imagery, as well as the individual differences in people’s ability to create these scenarios. In addition to therapy, we use visual imagery when we remember the past and plan for the future; when we retain and manipulate visual information in our working memories; it even plays a role in our moral judgments, and our intentions to help others. The capacity limits to visual imagery we have discovered will likely influence the amount and quality of information we are able to maintain and process during any of these situations. These limitations to our imagery can constrain what we are able to achieve, both in daily life and in therapeutic interventions. For now, the jury is still out as to whether or not our capacity for visual imagery can be improved (indeed, that’s the question I’m working on now). But what we do know is that by studying and creating new objective ways to quantify the capacity limits of our visual imagery we can begin to understand the full limitations to the human imagination and mind, and develop new ways to overcome these.